The Cuban National Assembly on Sunday elected Raúl Castro, the76-year-old armed forces minister, as president to succeed his brother Fidel Castro. “The mandate of this legislature is clear … to continue strengthening the revolution at a historic moment,” he said. 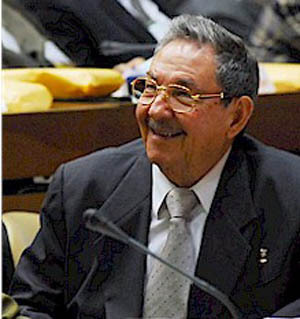 Raúl Modesto Castro Ruz (born June 3, 1931) has been since July 31, 2006, assumed the duties of President of the Council of State in a temporary transfer of power due to Fidel Castro’s illness. According to the Cuban Constitution Article 94, the First Vice President of the Council of State assumes presidential duties upon the illness or death of the president. Raul, who introduced his older brother to Marxism as a teen and to Ché Gueverra while they were exiled in Mwexico in the 1950s for a botched take-over attempt, told the council: “I take on the responsibility entrusted to me deeply convinced that, as I have often said, there is only one Commander in Chief of the Cuban Revolution.